Despite appearances, the oceans are far from silent places. If you dunk your head underwater you’ll hear a cacophony of sounds from wildlife great and small, crashing waves, and even rain. And it’s louder still for creatures attuned to these sounds. However, humans are changing these ocean soundscapes. Our recent research showed that changes caused by people, from ocean acidification to pollution, are silencing the seas’ natural noises. (We’re also filling the oceans with human noise). This is bad news for the species that depend on these noises to find their way. All over the world you can hear a lively crackling sound made by thousands of snapping shrimp that live along coastlines. These common shrimp, often referred to as pistol shrimp, have a large claw that they can close with such force that a cavitation bubble is formed. As this bubble implodes on itself a loud snap is created – like a pistol shot – which can be heard over long distances. In fact, snapping shrimp are the loudest marine invertebrates, and second only to the noisest marine animals, which are sperm whales! Snapping shrimp are found all over the world, including in coral reefs, kelp forests, seagrass beds and mangroves. Other types of animals create ocean noise too. Urchins and parrotfish make clearly audible chomping sounds as they scrape algae off rocks. Many fish are frequent and loud talkers and make an array of sounds such as chirps, burps, whistles, knocks and so on. They use these to mark out their territory, during fights and to locate mates. These biological sounds, together with those from rain, crashing waves and seismic activities, form the so-called underwater soundscape. Learn more about marine soundscapes watching this video. Sounds that are emitted from temperate and tropical reefs are loud and quite constant. As such these sounds form a reliable source of information for animals, particularly for navigation. Most animals in the sea let go of their fertilised eggs without providing any parental care. As these eggs hatch, small babies (larvae) are dispersedby ocean currents. Growing up away from coastal areas provides a safer place with fewer predators. However, after growing for a few weeks or months in the open ocean, it is time for these young animals to return to the coast to find a home. How do they find their way in the vast and uniform open ocean? Sounds and odours from coastal habitats are key cues that allow marine animals to find their new homes and replenish adult populations. Humans are increasingly dominating the physical and chemical environment. We are altering the carbon cycle through the burning of fossil fuels and the nitrogen cycle by extracting vast amounts of nitrogen for food production and releasing it as waste. Large amounts of this carbon and nitrogen liberation end up in the ocean. About one-third of the carbon dioxide that humans emit into the atmosphere dissolves in the ocean, leading to increased seawater acidity (or ocean acidification). This is an obvious problem for animals that produce a calcium carbonate shell or skeleton (such as corals, some plankton, and snails). Remarkably, ocean acidification also alters the behaviour of many animals by messing up their brain functioning. Earlier studies (see also here) have shown that ocean acidification can change the response of fish larvae to settlement habitat sounds by deterring them rather than attracting them. Learn more about the effects of ocean acidification on fish behaviour watching this animation video. 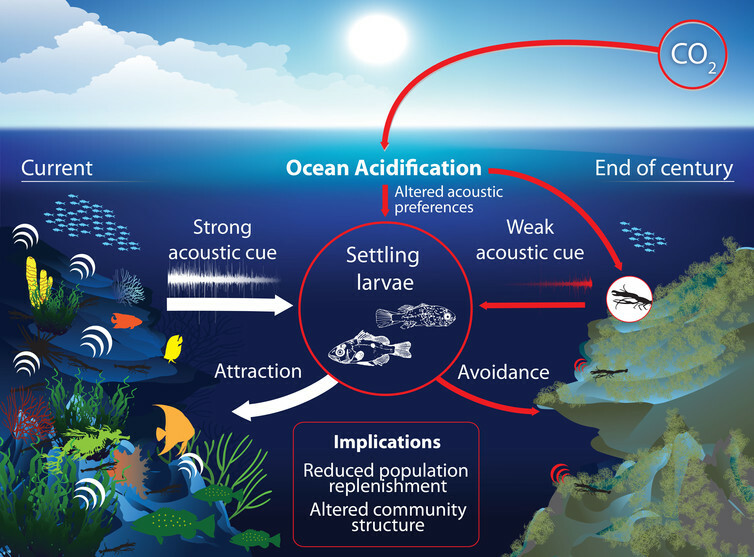 Two of our recent studies (see also here) showed that ocean acidification not only affects sound reception, but also the sounds that ocean ecosystems produce. If we don’t reduce greenhouse gas emissions, rocky reefs could be much quieter in 2100 than now. And snapping shrimps are the reason. Coastal discharge of nutrients from sewage plants and catchment runoff also degrades kelp forests and seagrass beds. These coasts are more silent than their healthy counterparts. In many parts of the world, kelp forests, seagrass beds and coral reefs have been replaced by carpets of turf-forming or mat-forming algae. These weedy types of algae have much lower diversity of species and provide less shelter and feeding opportunities for shrimps and other noisy animals. Degraded habitat means fewer animals, which means less noise. For larvae that use sound as a navigational cue, this means that fewer larvae will be able to successfully locate their home. And fewer returning larvae means less replenishment of fish stocks. Climate change and ocean acidification act at global scales and are difficult to stop in the short term. In contrast, nutrient pollution is a local stressor, which makes it more manageable. Various options exist for local communities to reduce nutrient pollution of coastal areas. These include improved sewage treatment, restoration of coastal vegetation (such as mangroves) and swamps that extract sediment and nutrients from stormwater runoff, and decreasing the use of rivers as outlets for polluted waters. Reducing the impacts of nutrient pollution on coastal ecosystems makes these systems more robust and provides them with increased resilience to cope with the impacts of ocean warming and acidification.